The modest Wright, whose real name is Phillip, was also recruited by Boise State, California, Washington and USC, but never was offered a scholarship by any of those schools. Only Arizona did. The four other Nagurski finalists in attendance were Texas defensive tackle Malcom Brown, Alabama safety Landon Collins, Ole Miss cornerback Senquez Golson and Louisville safety Gerod Holliman. Alabama head coach Nick Saban gave the evening’s keynote address. Lineman Randy White, accepted the Bronko Nagurski Legends Award, presented by Florida East Coast Railway. Each year, the FWAA honors a past winner from one its All-America teams. White, a defensive star at Maryland before becoming an All-Pro for the Dallas Cowboys, was a member of the 1974 FWAA All-America Team. The 2014 Nagurski winner, Wright, ranks in the top five among FBS players for total tackles (153), tackles for loss (28.0), sacks (14.0) and forced fumbles (six). He’s the only FBS player to rank in the top 25 of each of those categories this season. Wright is trying to become the first player since 1999 to be ranked in the top five for tackles, tackles for loss and sacks at the end of a season. When current Arizona coach Rodriguez was offensive coordinator at Clemson in 1999, linebacker Keith Adams achieved the feat for the Tigers, according to research provided by STATS. Adams finished second in total tackles (186), first in tackles for loss (35.0), and tied for third in sacks (16.0). Wright, who hails from Windsor, Calif., anchored an Arizona defense that helped capture the school’s first Pac-12 South Division title. For the Wildcats, who are headed to the VIZIO Fiesta Bowl to play Boise State and have posted 10 victories in a season for the first time since 1998, Wright led the Pac-12 in five defensive statistical categories: Total tackles (153), tackles per game (11.77), tackles for loss (28), tackles for loss per game (2.15) and forced fumbles (6). 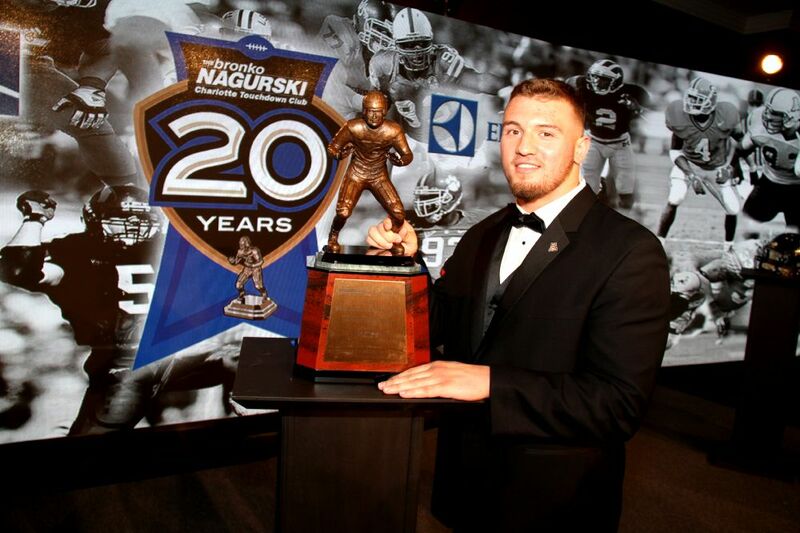 The FWAA’s national defensive player of the year award, given out since 1993, is named after the legendary Bronko Nagurski, who dominated college football at Minnesota as a bruising fullback and defensive tackle from 1927 through 1929. He could have been an All-American at any position and was the best player wherever the coaches put him. Nagurski led Minnesota to the Big Ten title in 1927 and a three-year record of 18-4-2. He went on to lead the fabled Chicago Bears to three NFL titles. During one game at Wrigley Field, he once broke a defensive player’s shoulder, knocked another out and ran into a brick wall and actually cracked it during a game-winning touchdown run.